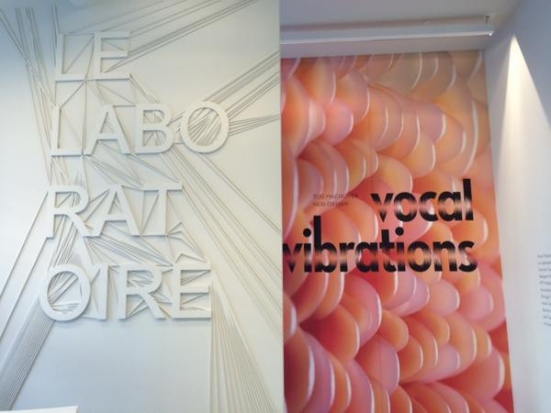 From the website: VOCAL VIBRATIONS is Le Laboratoire Cambridge's exciting opening exhibition. Composer and inventor Tod Machover and architect/designer Neri Oxman, each of the MIT MediaLab invite the public into fascinating and intimate vocal experiences through their collaboration with Buddhist monk Tenzin Priyadarshi, Director of the Dalai Lama Center for Ethics and Transformative Values at MIT, and a team of scientists and collaborators including Elena Jessop, Charles Holbrow and Rebecca Kleinberger, MIT professors W. Craig Carter and Al Grodzinsky, vocalists Sara Heaton and the Blue Heron Choir (directed by Scott Metcalfe), Julien Benayoun and William Boujon, bold-design, Situ Fabrication, Stratasys and Bowers & Wilkins. Vocal Vibrations is a voice and body installation that explores the relationship between human physiology and auditory and externally stimulated vibrations. Human health famously influences voice. This exhibition explores the hypothesis that voice influences human health through observable physico-chemical phenomena in body tissues and in ways consonant with yogic practice. Visitors enter a voice- and body-interactive setting, and see a kind of sensorial cocoon designed by Neri Oxman. With guidance drawn from Tod Machover’s vocal research in this rich collaboration between Machover’s students, scientists and the Buddhist monk Tenzin Priyadarshi, the visitor explores his or her voice through surprising corporal vibrations of potential significance to cellular and genetic structure and function. Related news: The Boston Globe, WIRED, The Tufts Daily, PR Newswire.